Hot Lola’s 4 percent surcharge aims to provide health care and a fair wage for staff. When Himitsu chef Kevin Tien opens his first fast-casual restaurant in Ballston’s Quarter Market food hall on Sunday, March 10, there’ll be more than spicy fried chicken on tap. The current James Beard nominee plans to use Hot Lola’s as a testing ground for a fair wage and benefits plan to grow across his restaurants—and beyond. In addition to paying employees at least $13 per hour (nearly double the current $7.25 minimum wage in Virginia), he’s adding a four-percent “wellness provision” surcharge to customer’s checks. The fee will go exclusively toward providing health, vision, and dental coverage for Hot Lola’s dozen-odd employees, and eventually membership to a neighboring gym. No portion of the wellness charge will fund ownership salaries or investors. “I want to see if I can flip the fast food industry upside down. You see it in San Francisco and Chicago. I think it’s time we do it here and change the way we take care of our employees,” says Tien. The 31-year-old started working in restaurants as a teenager in his native Louisiana for $5 an hour and with no benefits. Now, he’s part of a growing cadre of high-profile chefs in Washington and across the country trying to better the system. Tien got the idea for the wellness provision from chef Abe Conlon and business partner Adrienne Lo of the lauded Fat Rice in Chicago, which instituted a four-percent “fair wage and wellness” surcharge at the start of this year. (Tien and Conlon met and discussed the idea at the 2018 James Beard Awards, at which Conlon was a Best Chef winner.) The provision’s overall goal was to create “a sustainable life and healthy work environment for all those we employ,” and also help level the playing field between tipped front-of-house staff and the equally hardworking cooks in the kitchen. “Back-of-house staff lay the foundation for dining experiences in venues all over the country, but do not typically have access to fair wages and/or basic health benefits,” reads the wellness provision for both Fat Rice and Hot Lola’s. “The entirety of the customer’s tip is the legal property of the front-of-house staff, making it inaccessible to the back-of-house–either to increase their wages or to provide them with healthcare and benefits. Because this tip is such a large percentage of the customer’s check, it leads to massive income inequality between the staff who has access to it and the staff who do not. This increasing inequality is unjust and unsustainable and treats these hardworking individuals like second-class citizens.” The provision has since added roughly a 25 percent pay increase to non-tipped staff at Fat Rice, per PBS Chicago. A small number of other restaurants have moved toward higher pay and the benefits that are historically lacking in the restaurant industry. Cava made waves for paying $13 an hour in 2016, even as a then-smaller chain with 600 hourly workers. Neither is it unheard of at DC’s independent restaurants such as Rose’s Luxury, one of the city’s early adopters of a health care program for its staff shortly after it opened in 2013. 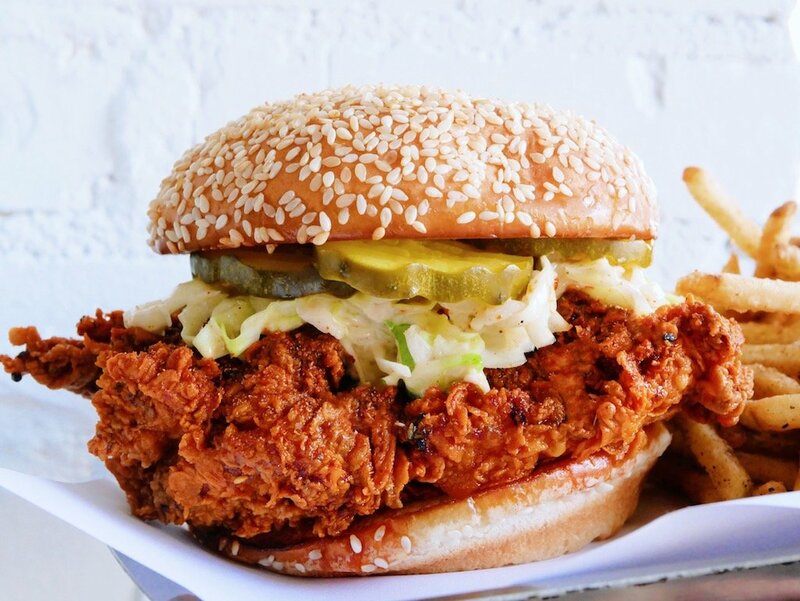 The risk for Hot Lola’s lies in adding another line charge to the customer’s check—no matter if it’s 44 cents on one of the locally sourced, made-from-scratch, $11 chicken sandwiches. Even magnates like Danny Meyer have struggled when trying to change the system; the Union Square Hospitality entrepreneur began pioneering a “hospitality included” system over three years ago by eliminating tipping and raising menu prices to cover costs. Tien shies away from lumping sums together. Hot Lola’s fair wage and wellness plan is also designed to help waitstaff make a living wage in a fast-casual environment. The minimum wage in Virginia is $7.25 an hour (recent efforts to raise it to $15 by 2021 were shot down in the Senate, though it’s currently $13.25 in DC and on the way up). Tipped front-of-house staff like servers and bartenders earn a lower $2.13 an hour wage and can make up the difference with gratuities—often surpassing the minimum wage at higher-end restaurants (if they don’t meet the $7.25 benchmark, employers are legally required to do so). The cheffy fast-casual environment is more of a tipping gamble, with some customers leaving 20 percent like they would at a sit-down restaurant, while others tip like they would at a food court (i.e., little if anything). Neither Conlon or Tien are changing the standard gratuity system. At Hot Lola’s, customers can tip what they want, though the check suggests amounts for 18, 20, and 22 percent gratuities. As part of a plan to bolster employees and spread gratuities around the small restaurant, front-and-back house staff will rotate, kitchen to cashier. “We want to make a perfectly rounded employee, and it’s important to have every skill set in running a business. That way, they can go on to bigger and better things,” says Tien. Tien is purposely testing and “educating” at Lola’s, where the average check starts at $15 for a combo meal on the menu versus Himitsu’s pricier share plates and cocktails. He says if his clientele is accepting, he hopes to expand a version to the Petworth hotspot and his forthcoming Capitol Hill restaurant, Emilie’s. In the meantime, he wants keep the dialogue going with the city’s top chefs about how to better the lives of restaurant workers.